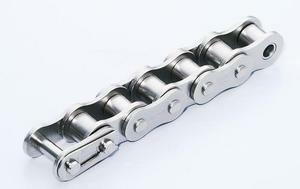 Tsubaki's RS-NP chains are made from our standard roller chain treated with a durable special nickel plating. It is very useful for outdoor applications where it is exposed to the elements such as rain and salts. Available in sizes RS25 to RS160 and RF2040 to RF2160.